A crisis helpline is a phone number, website, online platform, and etc., where people can get immediate emergency counseling. These were originally set up to help those contemplating suicide, but many have expanded to deal with many types of emotional crises. Crisis hotlines have been central to suicide prevention efforts; however, utilization among youth remains low. A sample of at-risk youth was surveyed about their awareness, utilization, and attitudes toward local and national crisis hotlines. Youth reported low rates of awareness and utilization, yet expressed a strong interest in phone hotlines (41% vs. 59% for new media categories combined). Youth reported stigma, but that help-seeking could be positively influenced by peers and adults in their support system. Implications include making crisis services available across several mediums and the importance of engaging trusted others in youth suicide awareness campaigns and prevention efforts. Signs of suicide are commonly used in suicide intervention training to assist the identification of those at imminent risk for suicide. 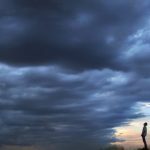 Signs of suicide may be particularly important to telephone crisis-line workers (TCWs), who have little background information to identify the presence of suicidality if the caller is unable or unwilling to express suicidal intent. Although signs of suicide are argued to be only meaningful as a pattern, there is a paucity of research that has examined whether TCWs use patterns of signs to decide whether a caller might be suicidal, and whether these are influenced by caller characteristics such as gender. The current study explored both possibilities. Data were collected using an online self-report survey in a Australian sample of 137 TCWs. Exploratory factor analysis uncovered three patterns of suicide signs that TCWs may use to identify if a caller might be at risk for suicide (mood, hopelessness, and anger), which were qualitatively different for male and female callers. These findings suggest that TCWs may recognize specific patterns of signs to identify suicide risk, which appear to be influenced to some extent by the callers’ inferred gender. Implications for the training of telephone crisis workers and others including mental-health and medical professionals, as well as and future research in suicide prevention are discussed. Mental illness is one of the most pressing public health issues of our time. While counseling and psychotherapy can be effective treatments, our knowledge about how to conduct successful counseling conversations has been limited due to lack of large-scale data with labeled outcomes of the conversations. In this paper, we present a large-scale, quantitative study on the discourse of text-message-based counseling conversations. We develop a set of novel computational discourse analysis methods to measure how various linguistic aspects of conversations are correlated with conversation outcomes. Applying techniques such as sequence-based conversation models, language model comparisons, message clustering, and psycholinguistics-inspired word frequency analyses, we discover actionable conversation strategies that are associated with better conversation outcomes. Recognizing the importance of digital communication, major suicide prevention helplines have started offering crisis intervention by chat. To date there is little evidence supporting the effectiveness of crisis chat services. To evaluate the reach and outcomes of the 113Online volunteer-operated crisis chat service, 526 crisis chat logs were studied, replicating the use of measures that were developed to study telephone crisis calls. Reaching a relatively young population of predominantly females with severe suicidality and (mental) health problems, chat outcomes for this group were found to be comparable to those found for crisis calls to U.S. Lifeline Centers in 2003–2004, with similar but not identical associations with specific helpers’ styles and attitudes. Our findings support a positive effect of the 113Online chat service, to be enhanced by practice standards addressing an apparent lack of focus on the central issue of suicidality during chats, as well as by the development of best practices specific for online crisis intervention. We conducted a systematic review of research into callers making multiple calls to crisis helplines. Two databases were searched, identifying 561 articles from 1960 until 2012, of which 63 were relevant. Twenty-one articles from 19 separate studies presented empirical data about callers making multiple calls to crisis helplines. Of the 19 studies, three were intervention studies, five were surveys of callers and 11 were call record audits. Most studies were conducted in the USA and defined frequent callers as people making two or more calls. 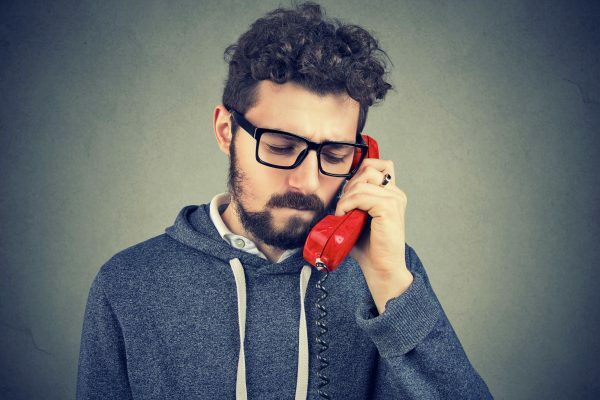 Frequent callers were more likely to be male and unmarried compared to other callers. There were no reported differences between frequent callers and other callers with regard to age, mental health conditions or suicidality. Three studies tested interventions designed to better manage frequent callers. These studies, even though small, reported reductions in the number of calls made by frequent callers. Suggested techniques for responding to frequent callers included: limiting the number and duration of calls allowed, assigning a specific counsellor, implementing face to face contact, the service initiating contact with the caller instead of waiting for callers to contact the service, providing short term anxiety and depression treatment programs by telephone, and creating a specific management plan for each frequent caller. Future work requires robust study design methods using larger sample sizes and validated measurements. Many people now text rather than call for help, allowing computer scientists to study anonymous data files and learn which counseling tactics work best. The rise in social media has caused creators to think outside the box. Facebook users can now send their friends links to various crisis hotlines if they believe their friend may be at risk of suicide. California’s State Senate has voted to pass SB 972, that would require public, charter, and private schools to print a suicide prevention hotline number and/or text crisis lines on student identification cards for grades seven through all college institutions. The news of celebrities committing suicide can cause a rise in suicide in our population. This news can trigger others already suffering with thoughts of suicide. This short document talks about the rise of suicide in the US. It has statistics along with tips on what States and communities can do. Crisis Trends empowers journalists, researchers, school administrators, parents, and all citizens to understand the crises their communities face so we can work together to prevent future crises. Summary of Research and Evaluation of Crisis Helplines. (2013). Lifeline Research & Evaluation of Crisis Lines,1. Crisis Call Center was established as an outreach program of the University of Nevada, Reno in 1966 in response to the high rate of suicide in Nevada. Working with Northern Nevada Adult Mental Health, a plan was created to establish a 24-hour suicide prevention hotline through the Department of Psychology at the University of Nevada, Reno. Over the years the center has expanded it’s services to address other crisis situations such as domestic violence, substance abuse and child/elder abuse or neglect. This center is one of the longest continuously operating crisis centers in the country and is accredited by the American Association of Suicidology. The mission of the Nevada Office of Suicide Prevention is to reduce the rates of suicide and suicidal acts in Nevada through statewide collaborative efforts to develop, implement and evaluate a state strategy which advances the goals and objectives of the National Strategy for Suicide Prevention. Nevada 2-1-1 has links to programs that provide immediate emotional support; assistance with shelter; domestic abuse, legal information and advocacy; referrals for medical treatment; ongoing counseling and/or group support; and other related services. 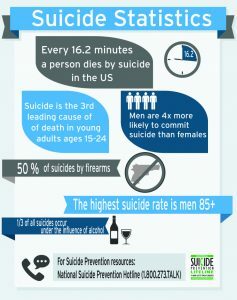 This infographic has current suicide statistics, along with the number for the national suicide prevention hotline. This infographic has information on the signs that someone may be contemplating suicide, how to help, and the number to the national suicide prevention hotline. 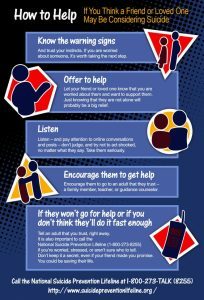 This infographic discusses how to talk with your teenager about suicide and mental illness. 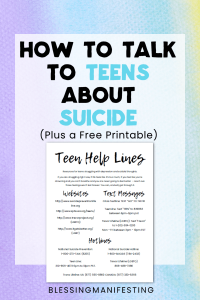 It has a handy section with many resources for teens including websites, crisis text line numbers, and crisis call line numbers.